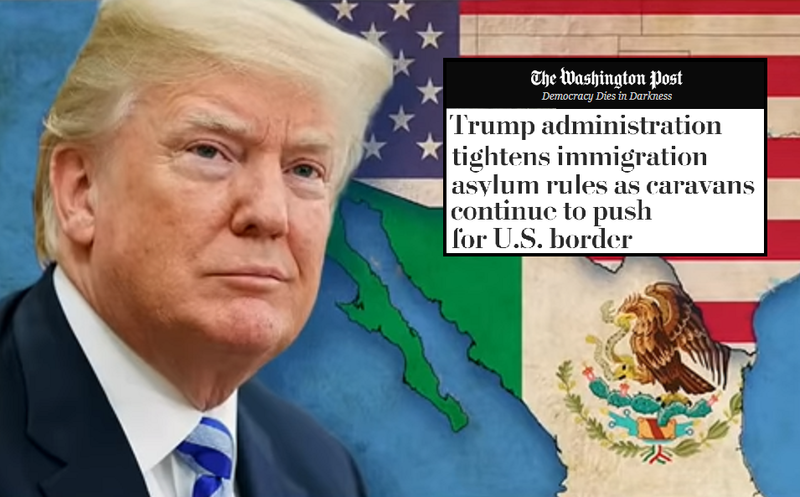 Two days after the Midterm election results became known, President Trump threw down the gauntlet towards the Democrat-controlled House with a new policy regarding asylum requests for anyone crossing the border from Mexico. As from now, illegal migrants entering through the southern US border with Mexico will no longer be eligible for asylum. Announced by the Departments of Justice and Homeland Security, the ruling will effectively stop asylum for those who breach any presidential restriction on entry. The new asylum rule, known as the Interim Final Rule, was announced by Acting Attorney General Matthew Whitaker and Homeland Security chief Kirstjen Nielsen. Related coverage: <a href="http://thegoldwater.com/news/41524-Caravan-Immigrants-Hoping-The-Republicans-Lose"> Caravan - Immigrants Hoping The Republicans Lose</a>. In a joint statement, they said the President has the power to "suspend the entry of all aliens" and to impose "any restrictions he may deem to be appropriate on them" if they are judged to be "detrimental" to US interests under the Immigration and Nationality Act. In other words, other than going through the official points of entry, any immigrant that tries to cross the border illegally as form now will no longer be eligible for asylum. Human rights group Amnesty International said the US President was using "dehumanising rhetoric". Its spokesman said: "Asylum is not a loophole, it is a lifeline." "This policy needlessly places the lives of thousands of people in danger." The Democrats better get their things in order quickly because from the looks of it with everything already done since the election result became known, Trump is gonna play some serious hardball. Such special morons, God Bless their hearts. So Crossing the border illegally is fine & dandy. Then why even have immigration laws eh? America is not an anarchist country, we are a country of law, liberty & freedom. If one want`s to be part of that, then follow the legal means to gain residency & citizenship. The stupidity of the left never ceases to amaze me.